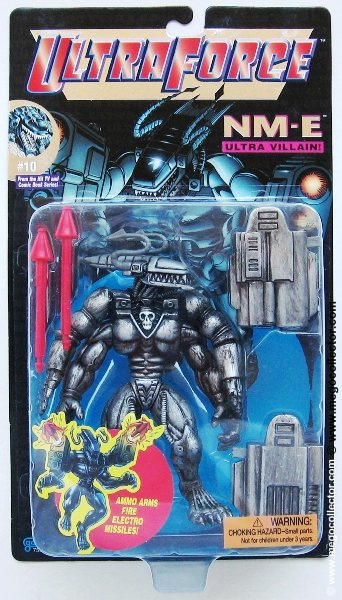 Ultraforce (Asst. 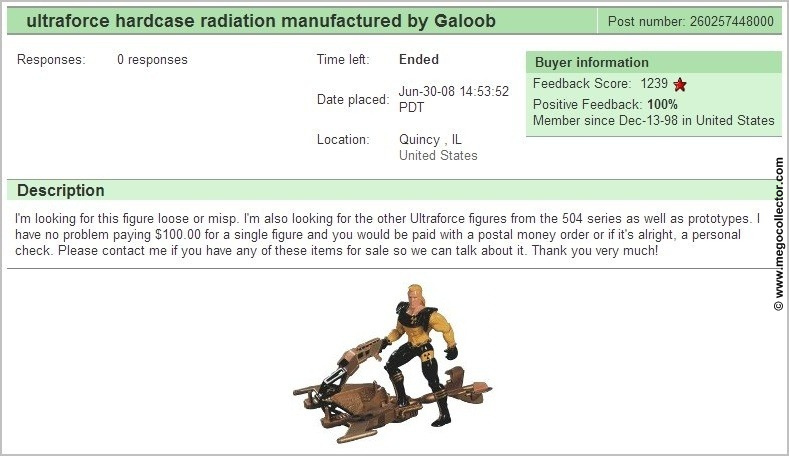 75596) action figures and accessories were produced by Galoob in 1995 and early 1996. 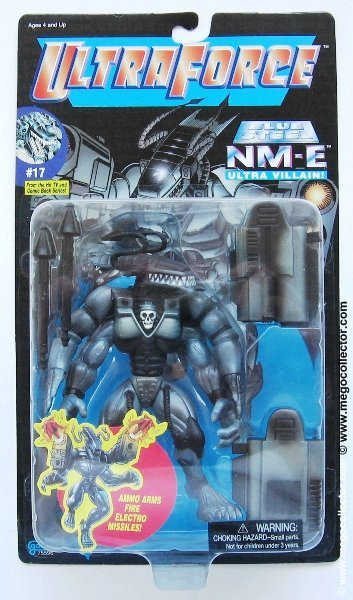 The Ultraforce action figure line is part of a very successful television and comic book empire; however this line was not as well received as anticipated. 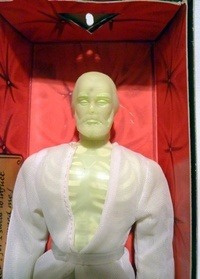 Perhaps, it was the introduction of what was thought to be a “chase” figure in each case. 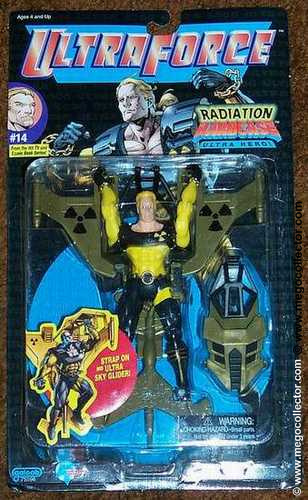 This figure rarely made it past the receiving area of any retail establishment. Quickly, those collecting the series realized that they may never finish completing a set, so why bother collecting them at all. 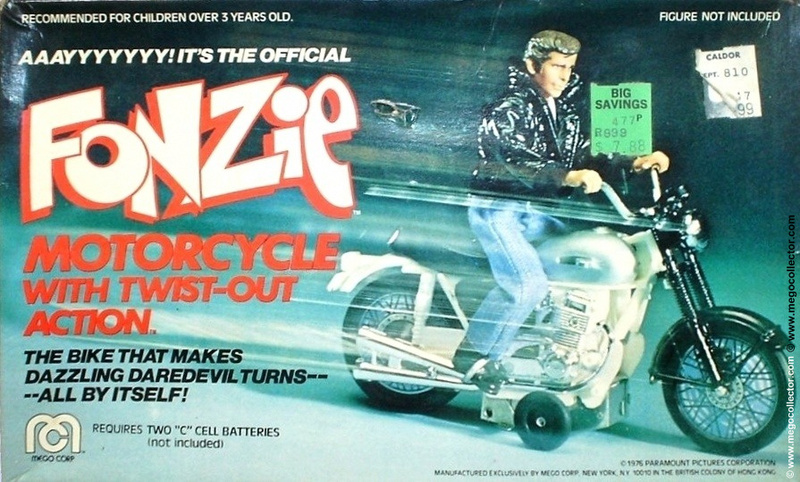 It wasn’t long after this short lived experiment ended up on the shelves of the major discount chains at a fraction of the original cost. 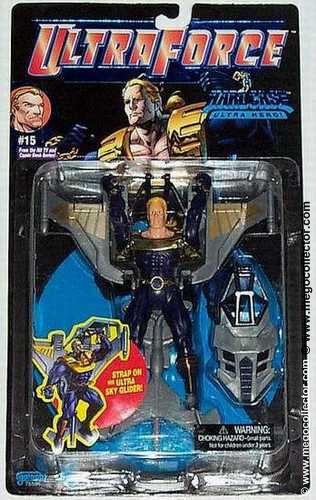 This “chase” figure, however, may be the Ultraforce action figure lines only remaining, redeeming quality. 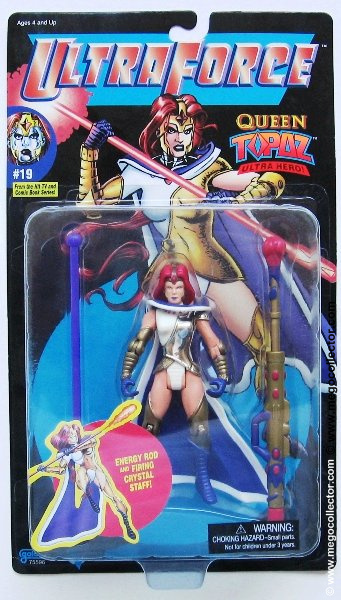 The black carded subset which were issued one per case and originally intended for production of 5000 figures. The final run of the black carded subset only consists of 504 of each to fulfill contract requirements. These 504’s (as these are commonly called) are extremely difficult to obtain. 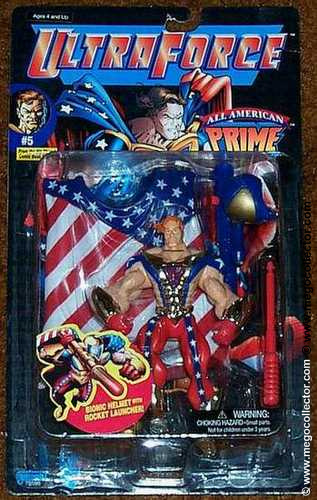 As for Prime #0 (if memory serves), this was not issued in the case assortment; however, sold through magazine and comic book stores (or at least originally). This image is of three of the five Queen Topaz carded examples I have in my collection. 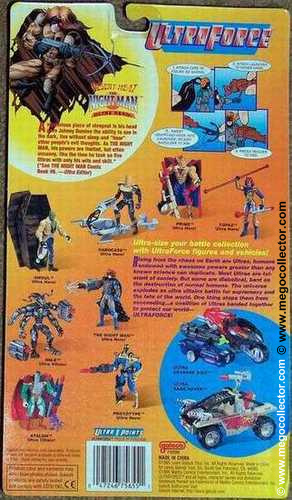 This is what Galoob had to offer on their website in 1995. 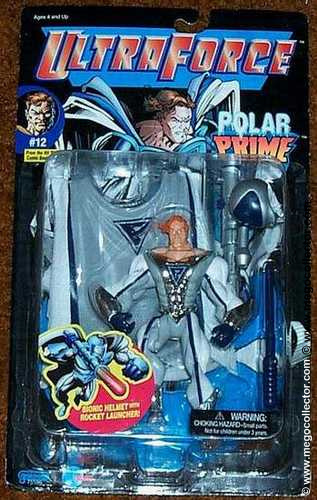 Starting in the Fall of 1995 you have found these cool, 5″-5.5″ tall, highly decorated action figures on your store shelves: PRIME(tm) #1, PROTOTYPE(tm) #2, HARDCASE(tm) #3, TOPAZ(tm) #8, GHOUL(tm) #6 , THE NIGHT MAN(tm) #9, ATALON(tm) #4 and NM-E(tm) #7. 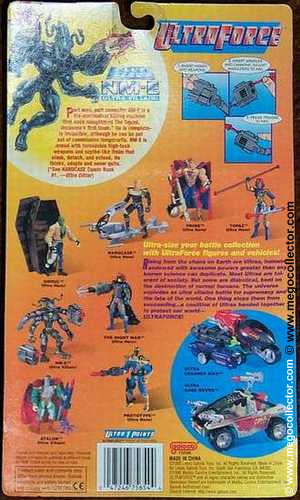 Scheduled for release in the Fall of 1996: RUNE(tm) #22, LORD PUMPKIN(tm) #26, SLUDGE(tm) #23 and PRIMEVIL(tm) #24. 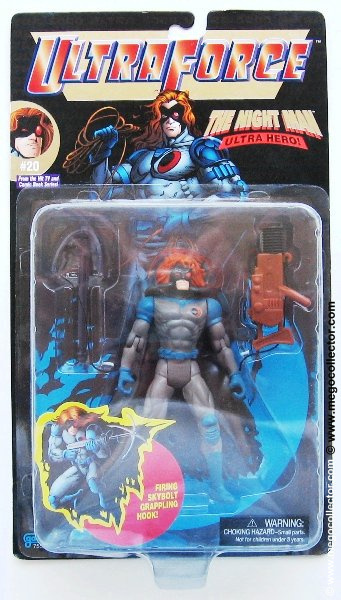 These Ultra warriors with action accessories come packed on an orange blister card with original figure illustrations from Malibu® Comics. 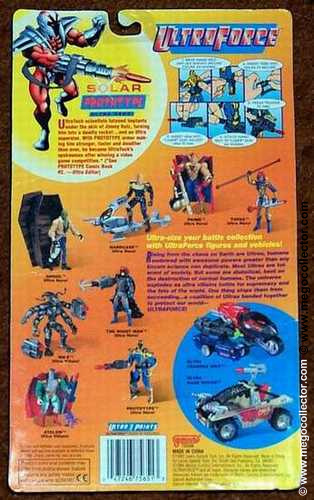 The toy cross- sell and character bios with comic book story line references are found on the back of the card. All figures are designated with a special style number for collectibility. 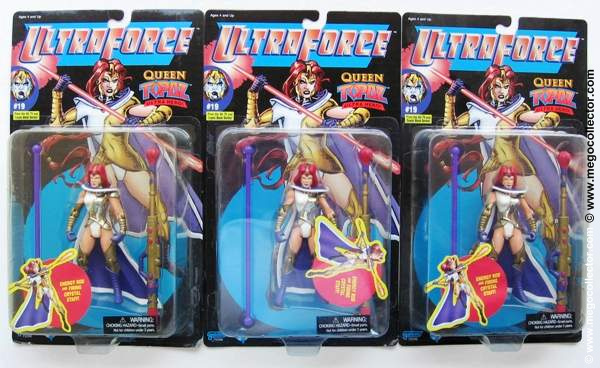 To help heat up the UltraForce action, we have created a series of special limited edition figures called the “Ultra 5000.” Grab ’em before they’re gone because approximately 5,000 of each limited edition figure style will be produced. These figures will come packaged on a specially designed black blister card. Like the regular figures, all limited edition figure styles will be designated with a special style number for collectibility. 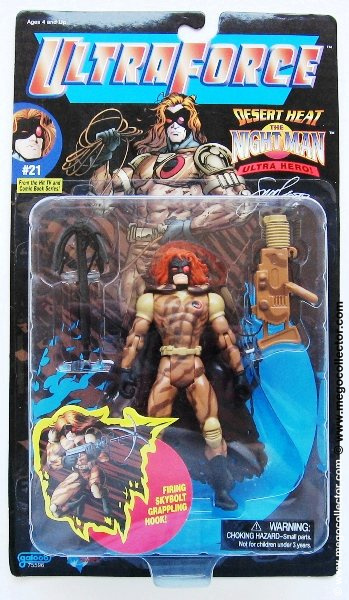 The first five limited edition styles of Ultra warriors will be a basic PRIME(tm) figure on a gold foil package (#0), a basic N-ME(tm) figure on a black foil package (#10), a basic THE NIGHT MAN(tm) figure on a silver foil package (#20), a basic TOPAZ(tm) figure on a red foil package (#25), and a basic HARDCASE(tm) figure on a blue foil package (#15). 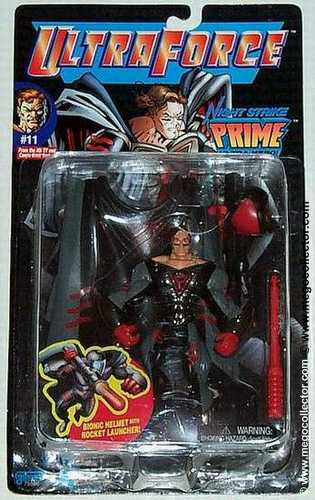 The next scheduled limited figures–Night Strike PRIME(tm) #11, All American PRIME(tm) #5, Red Slayer NM-E(tm) #16 and Polar PRIME(tm) #12–are specially themed and decorated figures on a striking black blister card. 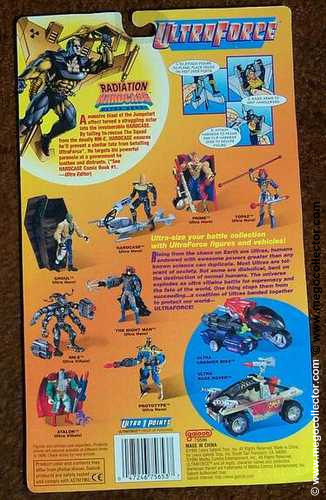 In addition to these nine limited edition figures, we have another 26 figures (see next page but not all are shown) in development for 1996. To date, all limited edition figures (with the exception of Gold Foil PRIME(tm)–a Heroes World exclusive) are being distributed randomly to mass market retailers. Each master carton holds 12 figures and will be packed with one limited edition figure per master carton. The first retailers to get the limited edition figures will be comic book retailers (with a special blue foil HARDCASE(tm) Heroes World mix), Target, Toys “R” Us and K-Mart. Plenty of other stores will carry these figures, but let them know you’re waiting for them! 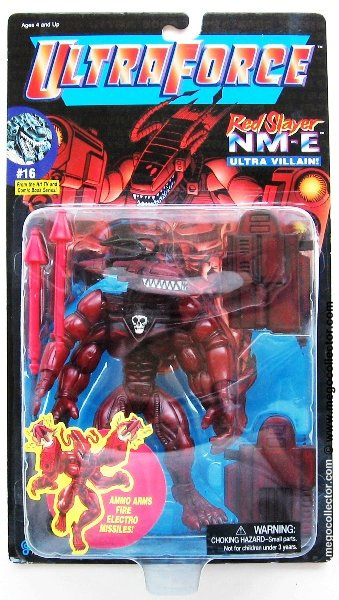 Also be on the look out for the Ultra Rage Rover(tm) vehicle coming in the Spring of 1996 and the Ultra Crasher Bike(tm) and Ultra Tri-Fighter(tm) vehicles rolling out in the Fall of 1996. 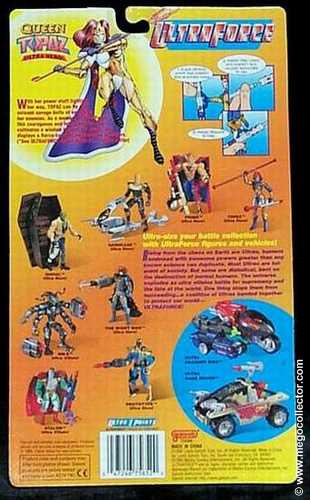 So gear up with Galoob for UltraForce in ’96! The images provided below are from my personal collection. I had collected the black carded subsets, I do not have any of the more common orange carded examples or vehicles. The 504 Subset of card backs. 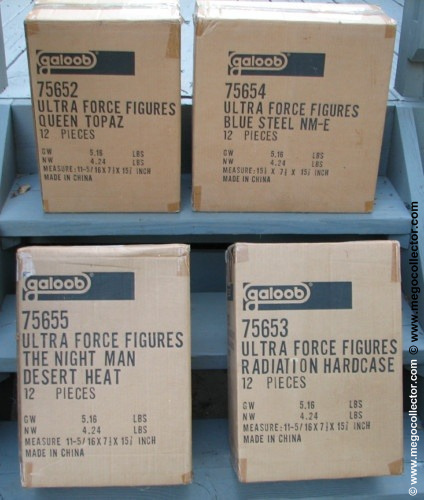 The following images were taken from the Galoob website, many years ago on the homepage that featured their Ultraforce products. Logically, we should be able to calculate the number of figures produced and distributed. 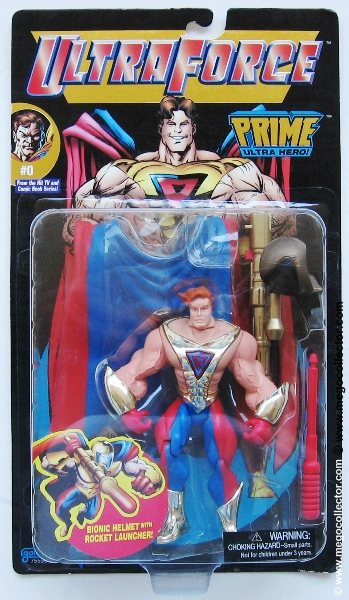 Assuming that Prime #0 was not a regular released issue, add the remaining subset figures. The total of 44,720 should equal the number of cases. 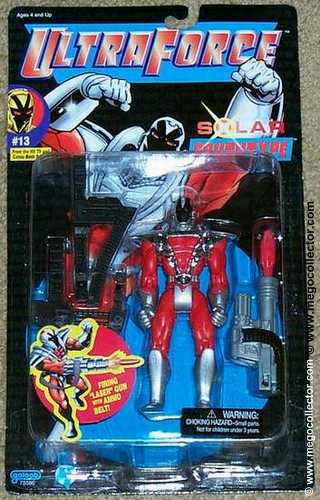 The case was packed 12 per case, so the number of regular issue orange carded figures would be 11 figures per case. The total number of orange carded figures is 491,920, divided by 8 different figures is approx 61,490 regular issue figures. If the assumption is that the 504 figures were never packed in the regular assorted case, then subtract 2520 cases. This would produce a total of 58,025 regular issue figures. As it turns out, at least some of the 504 figures were packaged in cases of 12, that were not assortments however a case of identical figures. If all 504s were packed in this manner, then remove only 210 cases from the equation. This would yield approx 61,201 regular issue figures. No matter how the regular issue figures are calculated to exist, these production numbers are extremely light compared to other mainstream action figures. Note: I have been able to obtain 504 figures from two sources. In the earlier years of eBay, I picked up a set of 504s and a few duplicates. However, at a flea market (around 2000) in the Dale City, VA area, I picked up another set from a dealer who had these piled in with hundreds of other figures on a $1.00 table. 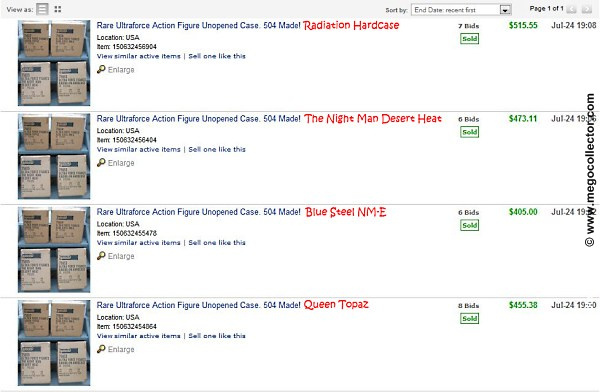 This leads me to believe that the figures may have been issued in the regular issue cases. 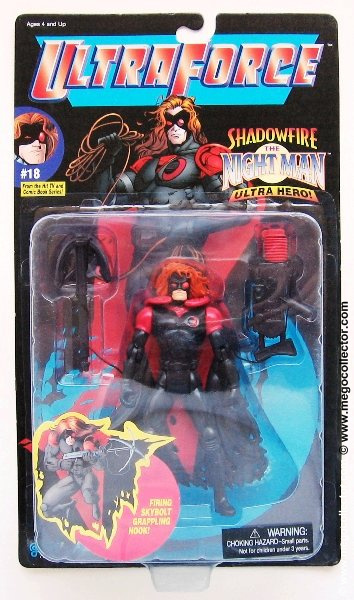 Update (September 5, 2008) I have not seen any Ultraforce 504 figure available anywhere since 2001. A periodic Google search rarely turns up any information on these figures. These are becoming increasingly scarce, so much so, that I have at least found a recent request to purchase any UltraRARE 504’s. 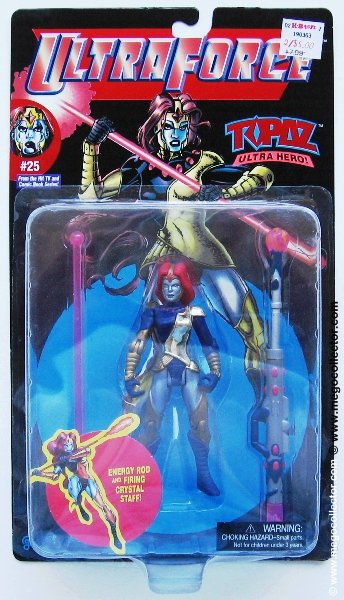 It is nice to see that there is still interest in these figures. This offer was for $100 each loose or carded. As interest grows, so will the offers. Incidentally, for those that may have considered this, the offer was not made by me.